Its been a while since I’ve been here. So, whats new? Well, halloween happened. We made costumes with the kids. Sadie saw a rainbow costume on pinterest, and so we decided we’d do something similar. 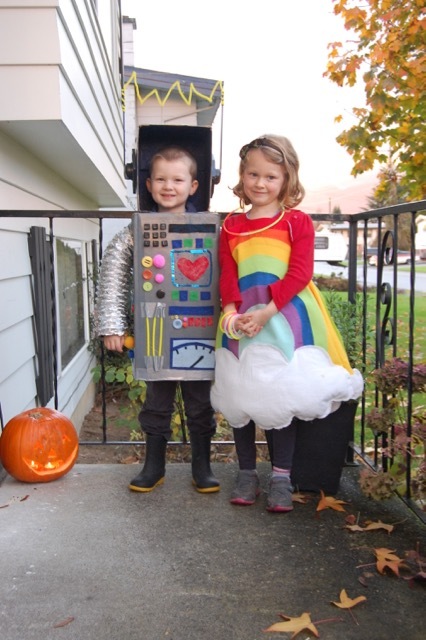 Lucas saw a racoon costume, but we switched to a robot because a robot would be more fun. Sadie helped me pick out the fabric and put it in order. We got it done in one afternoon. Lucas’s costume took longer. We painted boxes, used hot glue and glitter glue and glow sticks to finish his costume. Oh, and dryer hose. He loved it. Everyone loved it. Tony was out with us for that weekend and we trick or treated. He loved it. He had very good memories of trick or treating as a kid. I have only been twice as a kid, so it was lots of fun. We had to empty their bags of candy twice into the bigger pillowcase. We brought home a pillowcase full of candy. They were nice enough to let us split it three ways, and everyone was so happy. Tony and I devoured most of our share, and Lucas is almost finished his. What else is new? Nothing much. OH! I am in a crafty group with some friends friends, and we’re making homemade cold process soap this friday. Very excited about this. I’ve always wanted to make cold process soap, but I’ve been too chicken to deal with the lye. I need to buy some safety goggles, or find some. Its also getting close to Christmas. The kids have helped me write lists of what they’d like. Lucas desperately wants a remote controlled car. Sadie wanted bugs, a super long dress “like down to my toes” and a special tea cup of her very own. I’m sure we can work something out for both of them. Also, joined a moms group at church, and oh my goodness, its been such a blessing. Lucas looks forward to playing with the kids, especially his pretty friend Isla. I love it. Sadie has been getting closer to learning how to read. I’m so excited. We’re going to read a Ramona book together I think. I hope she likes it.